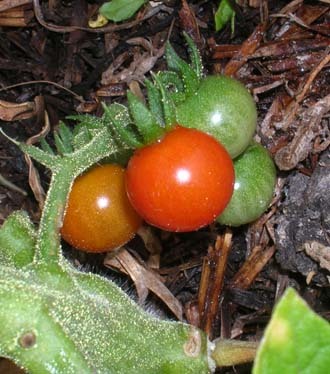 but an outside runner, cherry tomatoes from seed provided by my cousin. OK it was very tiny but at least it was tasty. 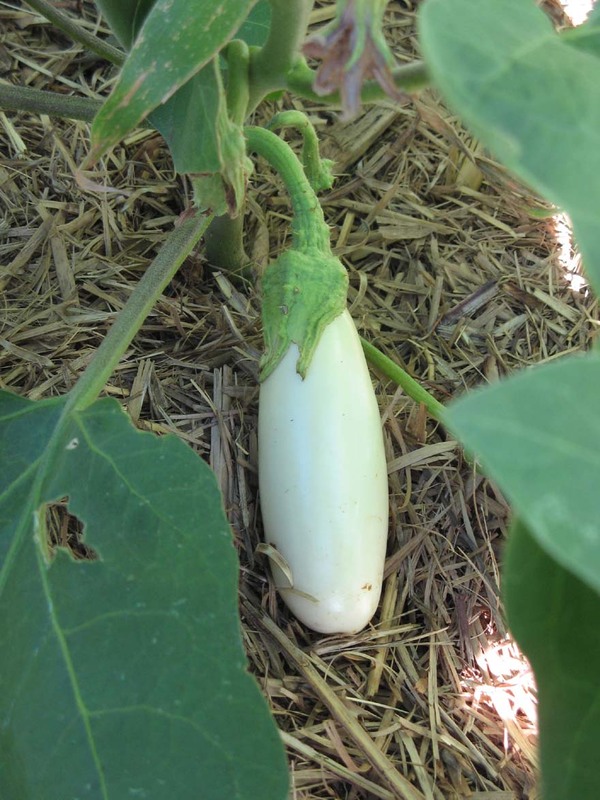 Our eggplants are also doing well. We ate our first one last week a Japanese Long White. Things are really starting to grow quickly. 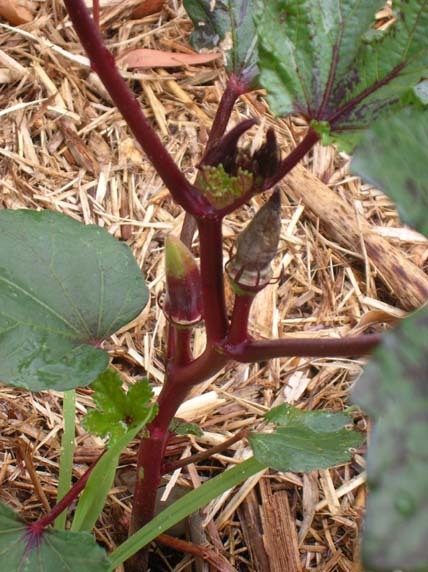 Over the last two weeks the okra ‘Burgundy’ has fruit. 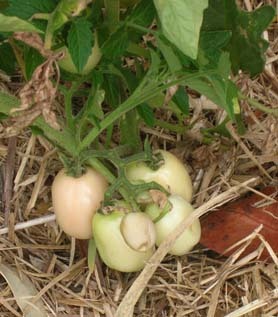 You can see the ripening fruit on the left, while the fruit on the right still has it’s papery covering on it. 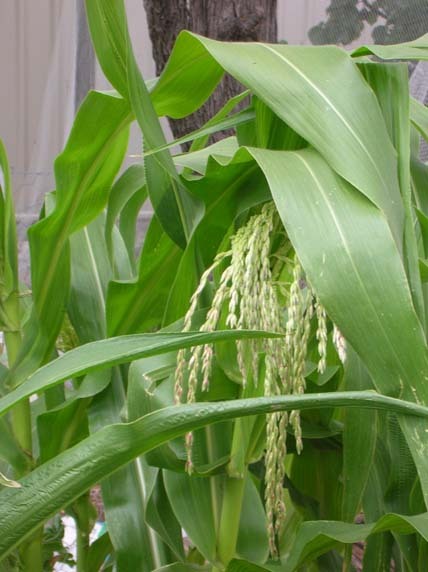 The corn has also started to put out its male flowers. These are our Golden Bantam sweet corn. 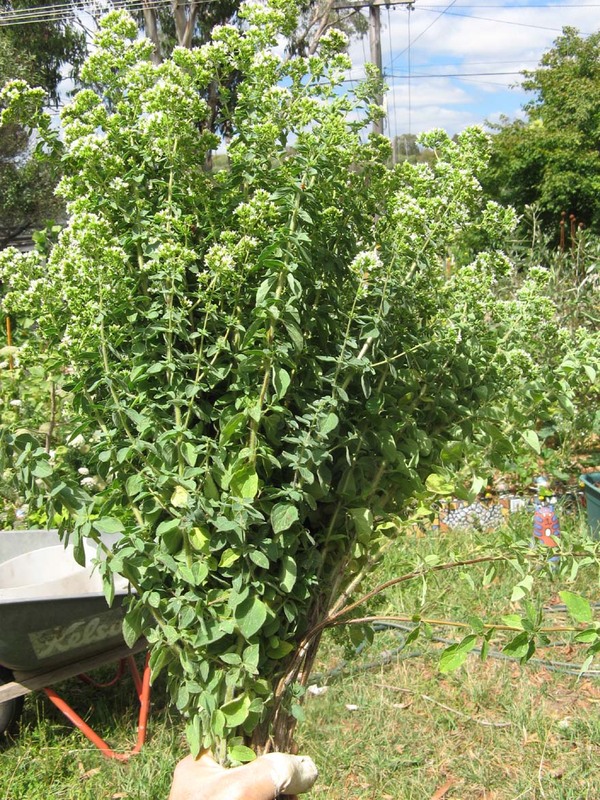 Last but not least TB has harvested a large bunch of oregano. 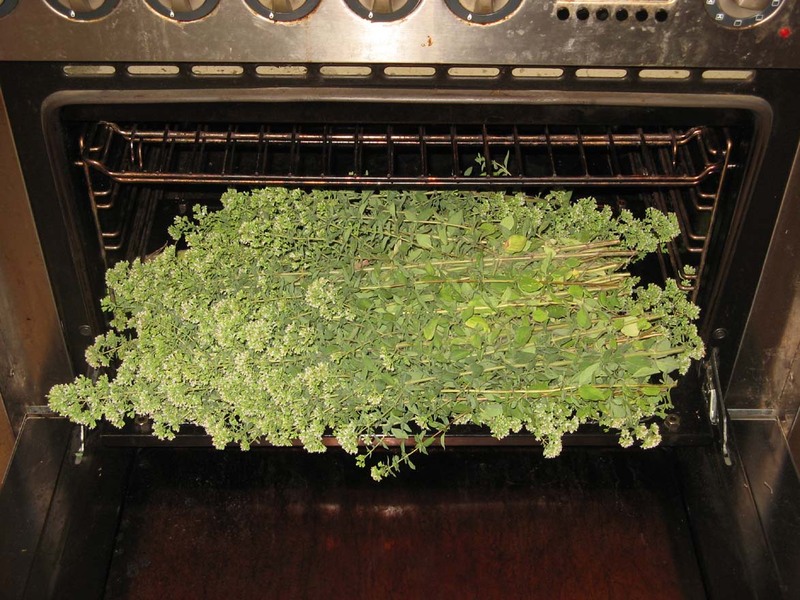 As you can see the bunch barely fitted into the oven. We got two large jars of dried herbs from this bunch. The plant will now have a chance to re-grow and provide at least another crop for drying in the future. Just prior to Christmas I spent a week in hospital. While not my favourite experience overall there were some interesting moments, both sublime and ridiculous. One positive about being sick at this time of the year is that TB bought me yummy treats like Young district cherries to eat. 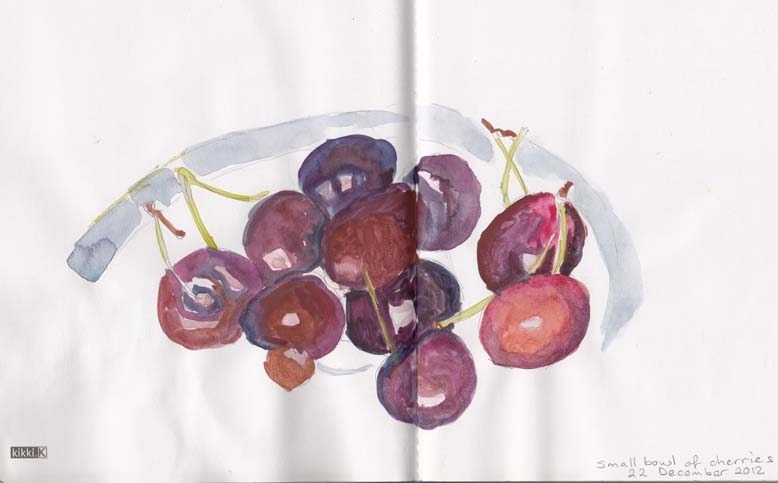 As I often spent quite a bit of time awake in the middle of the night they also provided a good subject for a quick watercolour sketch. On the definitely weirder end of the scale were some of the snacks provided by the hospital. While these crackers were perfectly edible I did ask myself ‘whatever were they thinking’ when it came to the product’s name! All the images it raises in my mind are very off-putting indeed. 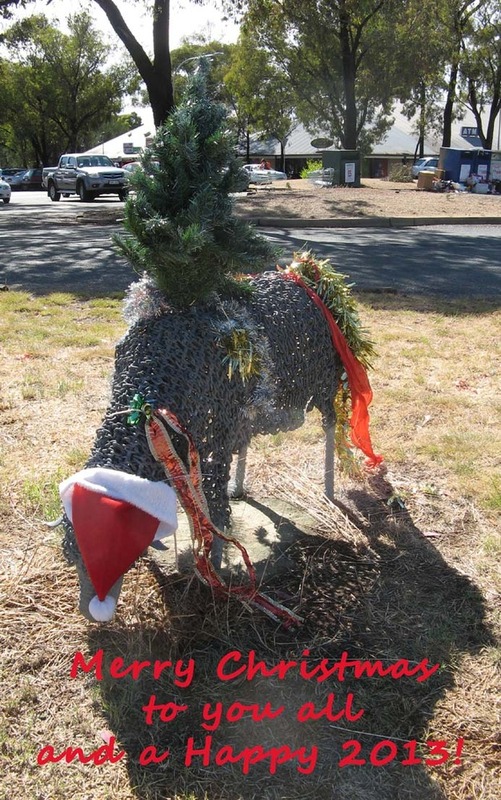 Meanwhile out in the rest of the world Christmas preparations were well underway. My sister was taking the pop-cake craze and turning them into a festive Christmas tree. I did make it home in time for Christmas proper. It was suggested that comfort foods were a good option for the convalescent. What could be more comforting than two eggs from ‘my girls’, tucked under cosies (knitted by friend M) with some home-made sourdough soldiers to eat the whole glorious eggy concoction. Wow, some rain at last. It may not have been much but it least it settled the dust for a day. My hay-fevered nose is grateful. Despite the lack of recent rain our garden is growing very quickly in the warm weather. and they are also using the young blue popcorn plants as additional supports. So far the pumpkins are growing, in a restrained fashion, but I don’t expect that to last for long! December garden discussions can’t go past the subject of tomatoes. I’m really pleased to see that the newest variety that we are trialling, the Pink Thai Egg tomato, is showing lots of fruit and is well in advance of all our other varieties. Sure we won’t be eating these for Christmas lunch, but it’s the closest we’ve managed to date. Speaking of ‘new’ things in the garden our newest fruit trees are delivering surprising results. We bought a White Adriatic fig a few months ago and already it’s putting fruit out. Yes that small knob where the leaf joins the stem. I will have to be good and remove the fruit to allow the tree to develop well in its first year, but it’s good to see it making such a good start. In May 2011 I took delivery of two native lime trees. Both are growing in pots and both have now survived two winters protected in our ‘grove‘, that fantastic growing process promoted by Jackie French. 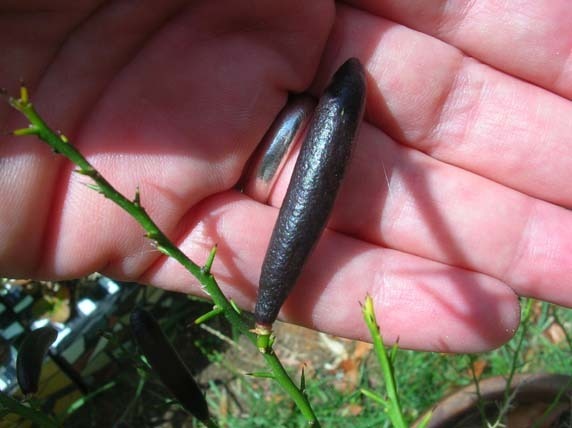 The fingerlime has really taken off and I have allowed some of it’s fruit to grow on this year (I removed about two thirds of the original fruit). As you can see the fingerlimes are growing strongly and I have my fingers crossed that I will get good quality fruit. The plant will be transplanted to a larger pot later in the year. As Christmas is approaching I couldn’t resist buying ‘Christmas in a pot’, my NSW Christmas Bush Ceratopetalum gummiferum. Buying a plant is still better value than buying the branches as cut flowers from the florist. I’m hoping that I can persuade this frost-tender native to survive tucked up to over-winter next year alongside my citrus plants. If you are also seduced into buying a Christmas Bush keep in mind that its a case of what you see is what you get. 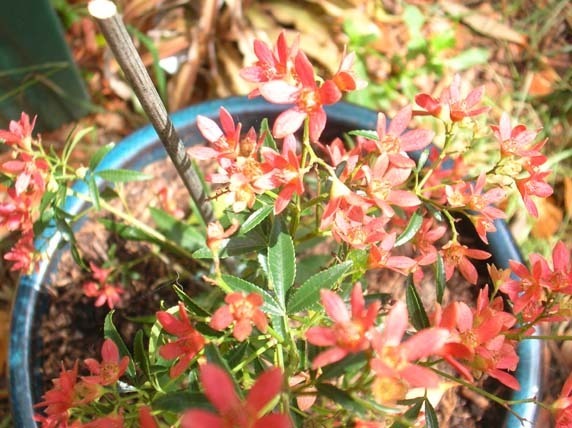 Buy the plant with the red-est flowers, they won’t change colour at a later date. I’ve always been a sucker for taking photos of the ‘scribbles’ on gum trees so its been interesting to hear that only recently that a group of retired CSIRO scientists has finallly worked out the life cycle of the little moths whose caterpillars make their marks on our local gum trees. The first scribbly gum moth was described and named by a English school teacher Edward Meyrick in 1935. The moth’s name Ogmograptis scribula, combines ogmos, Greek for furrow; graptis, Greek for inscribed/painted; and scribula, Latin for writing. Meanjin has a feature story on the discovery; while CSIRO’s story here provides a useful diagram for deciphering your local scribble. Our broody White Leghorn Letty, is causing some problems when it comes to egg laying – she’s not laying eggs, but our Australorpe Dotty, likes to lay her eggs with the other girls, so it’s getting to be a tight fit in the nesting box. Thankfully our Ancona Arte has more sense and is just laying in one of the other nest boxes. Yes, it’s that time of year agin. 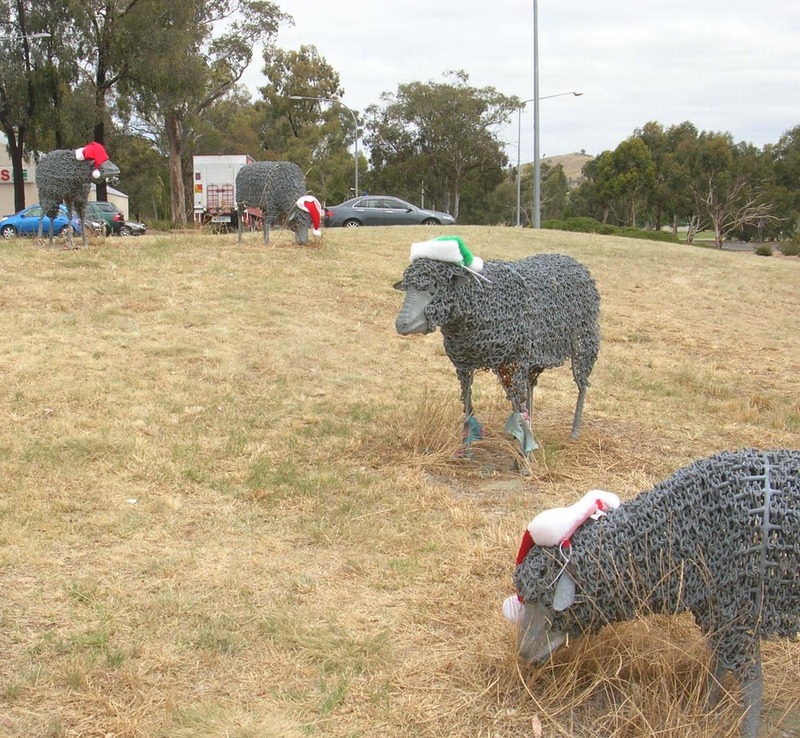 The Kambah Village sheep have received their first set of Christmas decorations. They are starting off with a basic set of hats this year. Heaven’s only knows how they’ll end up. I feel like an avian agony aunt! Our White Leghorn has decided to go broody. Every day she sits in the nesting box, waiting for a chooky miracle to occur. And it would be a miracle as we have no rooster so therefore no fertile eggs for her to hatch. So far that minor fact has not deterred her. I regularly heave her off the nest and send her out for food and company with the other girls, but she just ends up back where she started. It is no doubt a contest of wills and as long as she isn’t starving herself I’m not too worried. At least she isn’t pecking me (well so far) when I interrupt her eggy reverie. There’s not much I can do either for our other love lorn local bird. We have had a male Koel (a native cuckoo) calling long and loud for a mate these past three weeks. Indeed he starts calling at 4.00 am in his effort to find a mate. So far we are yet to hear a reply to his plaintive call. We only get Koels in Canberra at this time of the year as they migrate from elsewhere on the east coast of Australia. You can see and hear him here, pardon the shaky hand-held camera (I know David Stratton would not approve). Should you see a female Koel, attractively striped in brown and white, please send her in our direction. The neighbourhood would appreciate it!